During his days as a Northwestern State distance runner in the mid-1980s, Dr. Chris Maggio remembers helping Demon track and field coach Leon Johnson recruit future standout Mark Spikes when he competed for DeRidder High at the first Louisiana High School Athletic Association Cross Country Championships hosted in Natchitoches. Since then, the city, and NSU, have remained hosts for two days of LHSAA championship races and a practice day before competition begins. 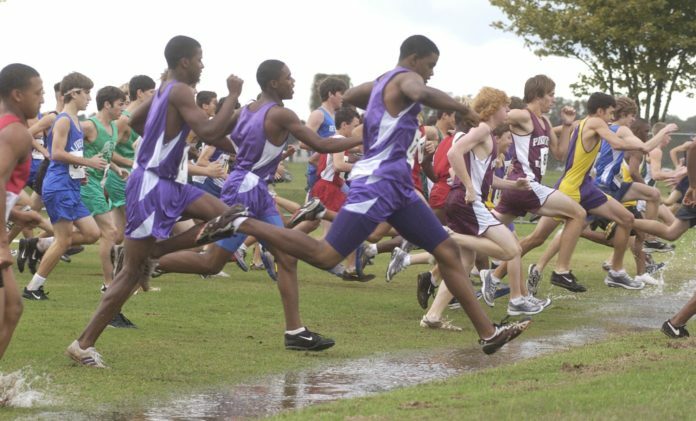 For a few years, the LHSAAalternated the state meet site between Natchitoches and Baton Rouge, before deciding the advantages offered in Louisiana’s oldest city were overwhelming. For at least the last quarter-century, the annual mid-November event has been staged on the NSU campus annually. About 3,000 competitors will vie for 14 state championships Monday and Tuesday at the Walter P. Ledet Track Complex as another 7-10,000 supporters are expected to visit Natchitoches for the 2018 LHSAA Cross Country Championships. Monday’s races involve runners from smaller schools, Classes C, B, A and 2A. Races begin at 10 a.m. and continue until after 3:30. Tuesday’s schedule begins at 11 with the Class 3A girls race, with girls in classes 4A and 5A following at 45 minute intervals until the sequence repeats in boys competition with the 3A boys at 1:15. Competition should finish after 3:15. Maggio and Burke have been very involved in administering the state meet for years, providing incomparable expertise. Natchitoches Mayor Lee Posey and Arlene Gould of the Natchitoches Convention and Tourism Bureau were also key last summer when the LHSAA awarded the 2018 and 2019 state meets to Natchitoches and NSU. Maggio, a lifelong Natchitoches resident, has been hands-on with the event from its outset, and realizes the value to the special “town and gown” relationship between Natchitoches and Northwestern. The guidance of Johnson, head track coach at NSU for 31 years until his retirement, has been pivotal. Mike Heimerman arrived in Natchitoches in 1996 to throw the shot put and discus for the Demons, and has never left, serving as an assistant coach after graduation, becoming head women’s coach and eventually succeeding Johnson in 2013. Johnson, still active at 78, remains on the meet’s steering committee while Heimerman and his staff pour many hours of planning and preparation into staging a constantly-improving LHSAA championship event. The enormous resources provided by the university, along with the nationally-recognized ability of the local community to welcome visitors (USA Today readers votedNatchitoches the “Best Small Town in the South” in 2015), provide undeniable appeal for LHSAA competitors and guests. Next articleA freezewarning is in effect from midnight to 9 a.m. Saturday morning.